CAS Voice Messaging Service provides a mechanism for the efficient creation, delivery and management of audio content to a user’s contacts. Built upon the GTMS framework the Voice Messaging features integrate seamlessly with the enterprise directory and telephony services. The solution can be used out of the box or integrated into custom applications utilising the GTMS API. The Voice Messenger enables users to record messages and save them through their standard telephony devices. 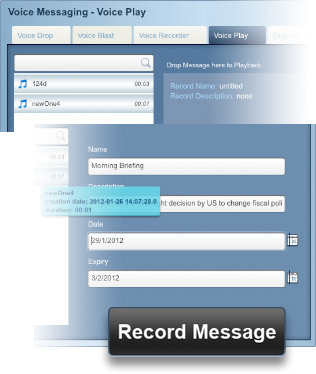 Users can playback, re record and store the message for future use. Once stored users can create “playlists” of messages in order to send multiple messages in a single action. 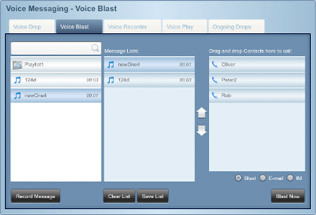 Users can distribute their messages on a case-by-case basis using the Voice Drop, or to a group of contacts through Voice Blast. Users can dial a single contact and during the call at any point select to distribute a message or playlist. During the drop the user may select to leave the call and more onto another contact. Users select a number of contacts and messages and select to blast them all in a single click whether immediately or scheduled for a time in the future. Integration with AD Distribution Lists provides easy access for internal message broadcasts. Users can select to notify users of an available Voice Message rather than blast them directly. In this scenario the contacts will be mailed to inform them that a message is available. Selecting a URL will instruct the server to call them back and play the message at a time convenient to the contact. All Voice Messages are stored within a File Store with no access to retrieve the file other than through the Voice Messaging procedures. All recordings and playbacks are tracked through the system for both security and analytical searches. Users progress updates in real time of all ongoing drops and blasts enabling them to re-join the call if required. Compliance rules can be applied to user accounts enforcing a workflow of approval prior to a message becoming available for distribution OR a blast request being actioned. We have started using medium for our blogging. Please click here to see our latest posts. Copyright © 2013 Globility Limited. All rights reserved.